ReVerie has been situated in the new Colchester unit in Essex since January 2010. The site is easily accessed by road (A12 & then to Colchester Town), rail (Colchester Town) and air (Stanstead & Earls Colne). Please click the thumbnail to view the map. 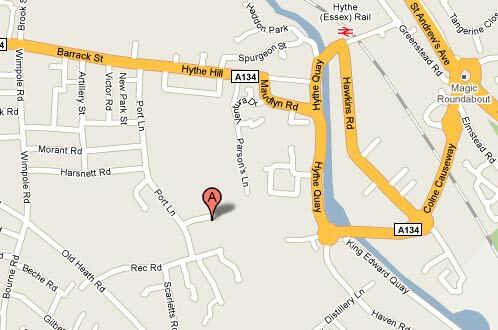 Reverie Limited, Unit 2 Chandlers Row, Colchester, Essex, CO1 2HG, UK. If you have satelite navigation then the GPS co-ordinates provide an easier way to find Reverie. On some satelite navigation systems the post code is an unreliable means of finding us. If it is possible please use the GPS co-ordinates. The nearest train station is Colchester Town Rail Station. It is a 15 minute walk from the station to Reverie. The nearest major railway station is Colchester Rail Station. You may need to switch trains to get to Colchester Town Rail station. The nearest major airport is London Stansted, approximately 1 hours drive from ReVerie. For light aircraft, Earls Colne airfield is 15 minutes drive away. If you would like to check the traffic situation before you set off on your journey then please click here. This will launch an external window and direct you to frixo.com.